The days of police beacons, strobe lights and flashing colored light bulbs are long gone. Today there are many high tech options for lighting your wedding reception & special event. The newest technology is LED Lighting. LED lighting has many benefits. One of the benefits is that these lights can produce over One million different colors. These lights are very powerful but always stay cool to the touch, unlike Par Cans which can cause burns to your guest if touched. Par Cans get VERY HOT! Is your reception or event under a tent? The ceiling of the tent works wonderfully with Uplighting and theatrical style lighting, such as subtle color changes, flowing water patterns, or a custom gobo displaying images of constellations and a delicate blue tint onto the white tent ceiling. This is done using our Nebulus Lights. You can read more about these below. At Party Animalz Event Lighting & Decor, we offer a full line of up-lighting or event lighting options (most uplights are not placed on trussing or stands, but on the floor firing upwards for the best effect) to completely transform your venue by washing the walls with any color you'd like. Our color wash uplighting will make any event or venue special. We have many event & wedding lighting ideas, please give us a call and let us show you what we can do to help you with your reception lighting needs. In the past, you were limited to simple lighting at your wedding reception. Maybe your DJ could bring mirror balls or some disco lighting for the dance floor. You couldn't ask them to make your white walled venue into a color washed wall. With today’s new range of LED Lighting, you can do just about anything at your wedding reception or special event. The second generations of LED uplighting were made up of 1.0 watt LEDs. These were remarkably brighter than the first generation LED fixtures. Even with the venue lights at normal banquet level, you could clearly see the effect that they made in the venue. You were still limited by the sunset time and windows in your venue – they still couldn't compete with direct sunlight. The newest fixtures for LED uplighting are the 25 Watt LED fixtures. Some have tri-colored LEDs (no need for separate Red Green Blue LEDs), others added White or Amber LEDs to allow a bigger color pallet to be achieved in your wedding venue. Party Animalz Event Lighting & Decor utilizes only the brighter 25 Watt LED fixtures and have the capability for both Amber and White LEDs for more color choices for your special event. Old Style Par Can uplighting with color gel filters have a difficult time reproducing Blues and Purples. First and second generation LED uplighting used to have a hard time with White and Amber hues. This new generation of 25 Watt LED Lighting eliminates the color matching concerns of earlier versions of LED lighting. LED uplighting can make your reception venue dramatic and stunning. Our high output fixtures put out over 5,000 LUX @ 1meter (25 watt fixtures). That is bright enough to make your venue absolutely amazing. Less than that and the lights won't have much effect at all. 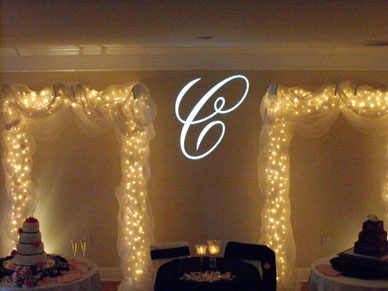 Want your names or monogram in lights? 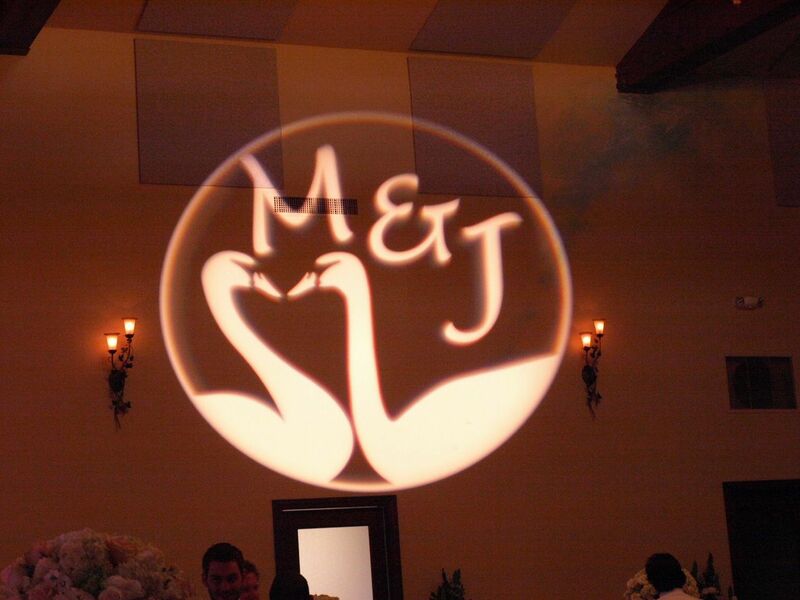 We can create custom light gobos for your first dance. Place it on the dance floor, wall or ceiling. We can have it rotate slowly. We can match the design of your cake, dress or invitations in the light design. Want more of a club feel? Enter the era of high-tech club style lighting, with Lasers or fast moving, color changing lights, and lights that create spinning patterns all over the dance floor and walls. Or, do you simply want a shifting color wash on the walls or columns in your banquet facility? 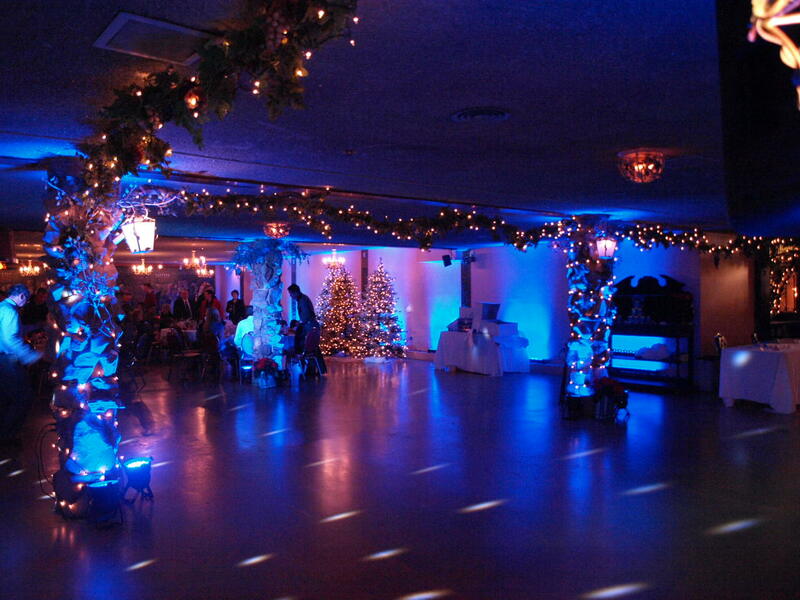 A professional DJ can create this type of soft atmosphere within your facility. Ask us about all the possibilities in club style or color scheme lighting. So, before you book a lighting specialist for your wedding, be sure to ask some basic questions about their Wedding LED Lighting. 3.Are all your fixtures the same make and model? If they mix and match styles of Wedding LED Lighting, the color will not be exact from one fixture to another. 4.Can they control the color or brightness of your LED uplighting? Do they stay the same color all night long or will they change colors (this should be your choice)? This is personal decision you must make – do you want the background color of your event to change or will you be bored and want changes to the lighting based on what is going on or you can utilize color changes to enhance dancing. 5.Will someone be on-site throughout the event to monitor the LED Lighting? This will correct for things like fixtures being accidentally moved, bumped or unplugged as the lighting technician will monitor things. A lighting technician can be added to any lighting package for an additional charge. 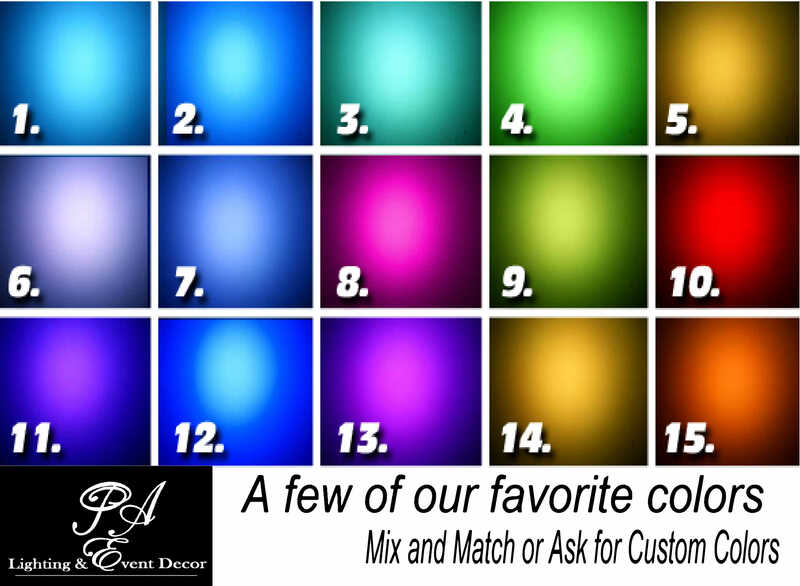 6.Do your fixtures only have RED-GREEN-BLUE LED color mixing or do you have AMBER or WHITE as well? Uplighting brings your wedding to life, dresses, your flowers and the room will all work together to create an inviting entertaining space. 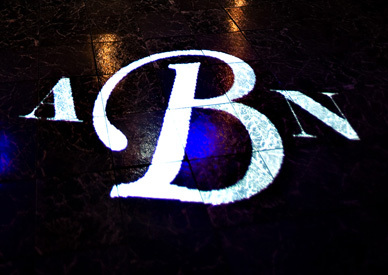 We use LED lighting exclusively for every event we provide uplighting. These are the safest and most environmentally friendly lighting options because there are no bulbs to burn out or replace and lights draw very little energy. The latest types of lights used are state of the art LED lighting. No heat is emitted from LEDs, you will receive brilliant colors to elaborate your event from LEDs and you are able to color mix to to custom tailer the color to your desired color.. LEDs can be customized to create any possible color. These lights are made up of red, green and blue individual LEDs that when combined in different intensities blend together to create just about any color. These lights are also very lightweight enabling them to be used on stands, on the floor just just about anywhere. All events we light we use LEDs for uplighting. 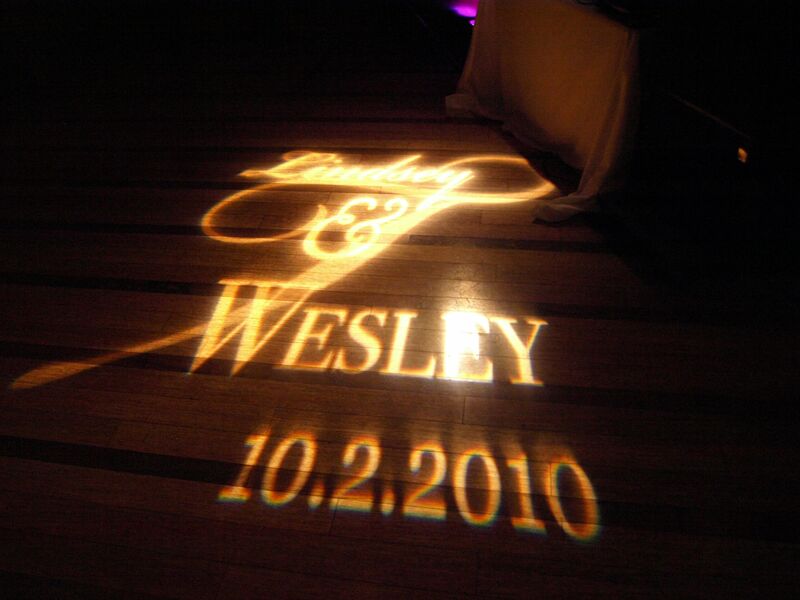 Historically the industry would use stage lights other words known as"PAR Cans" to uplight weddings & special events. These are Lights which use a high powered white light bulb that have a colored plastic which is used to cover the light to generate the color. The color generated by the stage lights are very limited and only can generate one color and also become VERY HOT and dangerous to children. Injury can occur very easily to your guests due to the heat generated by such lights.. Stage lights not also generate a lot of heat but also consume enormous amounts of electricity which some rooms may not be able to handle due to power consumption..
Just understanding what is possible with the use of LEDs to uplight your event is very helpful. Below you will find what is achievable with the use of uplighting. Painting with color is one of the most popular effects used today to generate washes of color by the use of LED lights strategically placed around the venue. The color can be set to a random motion to cycle threw the different color sets or the light can be set to (1) static color. You may wish to have a single color at the beginning of your event and as your music starts you may wish to have the lights cycle threw a bunch of different colors to liven up the evening. A single beam of color can be strategically placed on items around the room or on walls to accentuate the area.The idea of static lights is to accentuate specific items such as your wedding cake or to add depth and character to columns or other aspects of your room which will create an elegant look to any wedding. By adding such lights to the exits and or entrances of the room will give the event a desired feel of a grand entrance. Lighting up the exit of the room or venue can be a nice effect for the photos at night time. If you would like to set the mood on the outside of the venue as well as the inside, placing LED lighting outside can be a very dramatic effect. When coming up with a budget for your wedding think about lighting. 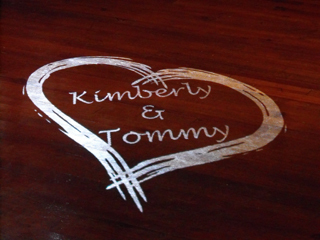 For a fraction of the cost of extra flowers, favors, or other types of decorations you can add the elegance and impact of painting with light to your wedding. Lighting not only works well during the entire event but it allows your flowers and other decorations to shine later on in the evening. When it's dark for the reception guests always notice the lighting and continually thank us and comment on how much it adds to their event. It looks great in the photos as well, turning ordinary into extra ordinary creating the most beautiful dancing event that your wedding deserves to be. Book Your Wedding & Event Lighting Today! We work with you to come up with one- of-a-kind lighting options for your wedding that will truly set your wedding apart and make it truly personal and unique. We can work within your budget to create the biggest impact. 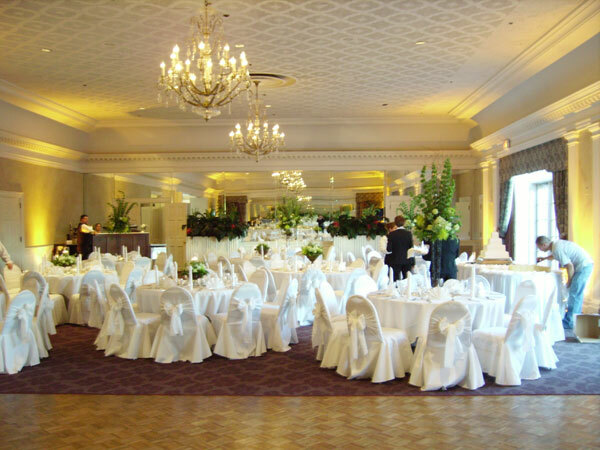 We have worked at many of the best venues in Connecticut and Beyond. 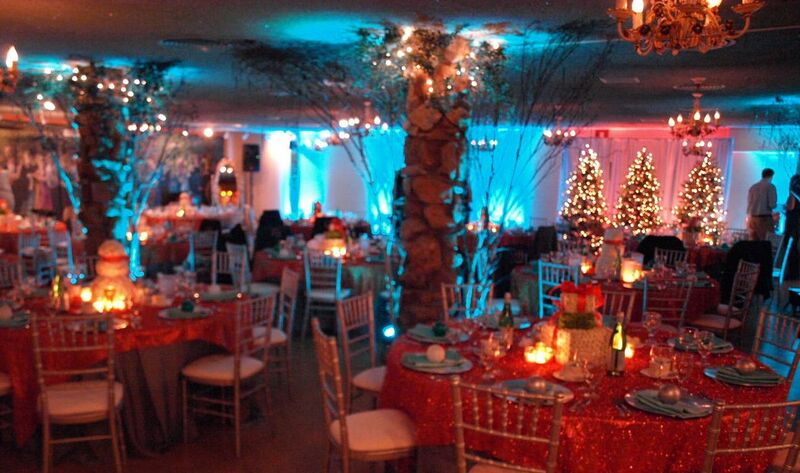 We can offer our personal insight as to what the best lighting options will be for each venue. This type of expertise and integration into your entertainment is what makes us one of the best entertainment companies in New England. One of our most popular option: You'll have full room coverage on accenting walls, windows, columns, tables and other venue features in a single or a rainbow of colors. Colors can slowly fade from one to another during social hour and dinner and then can pulsate or blink to the music once the dance floor opens. the equipment that may be used for lighting your event. We've set out to try and make lighting as simple as possible. Lighting can truly bring your event to life. Lighting can also help showcase elements and features that you like in a space or help hide things that you don't like about a space. Uplighting looks awesome in photos and can provide a great color layer to transform your venue or event space. 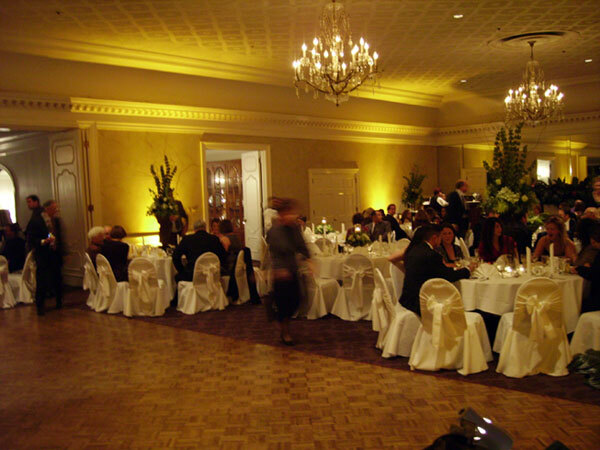 Uplighting fixtures can project light adding warmth, color & depth to any venue or event. nice for uplighting. But, colors like Greens can sometimes be very unflattering when used. Colors like blacks & brown can not be achieved. Generally we suggest at least one uplighting fixture for every 5ft - 10ft of wall, depending on the overall look that you wish to achieve. You can do solid colors throughout the entire room. You can also choose multiple colors throughout the entire room. You may have the desire for the lights change for different points through out during the evening. The Nebulus Lights creates millions of pinpoints of light. This give me look of stars moving in a night sky. With the blue glow behind the million pinpoints of light it creates a slow moving starfield effect. The Nebulus light has a very large coverage area. This light is great for large venues and tents. the light produces a blue/purple “nebulus/cloud” effect that slowly moves creating a captivating 3-D effect making the ceiling feel taller. 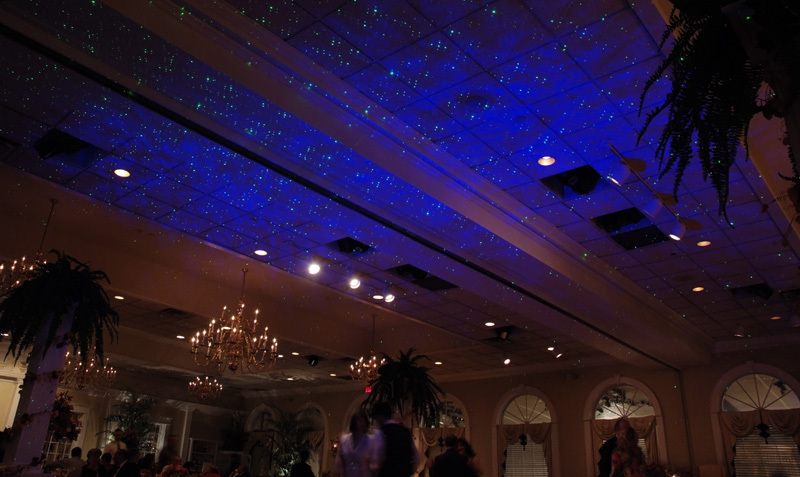 It’s a great light to use throughout the evening to dance under the stars or to create a fairy tale wedding effect. The Nebulus Lights is excellent to use with low ceilings. The optics create a large coverage area without having the light to be far way from the surface the Nebulus Lights is projecting on. The light also works well on white drape, walls, floors, and anywhere that you need a very large, dynamic lighting effect. Lighting can be the most cost effective way to enhance & transform your reception space. Make sure you choose a company that will ask questions, and is willing to show you how each of the lighting effects will change your space. 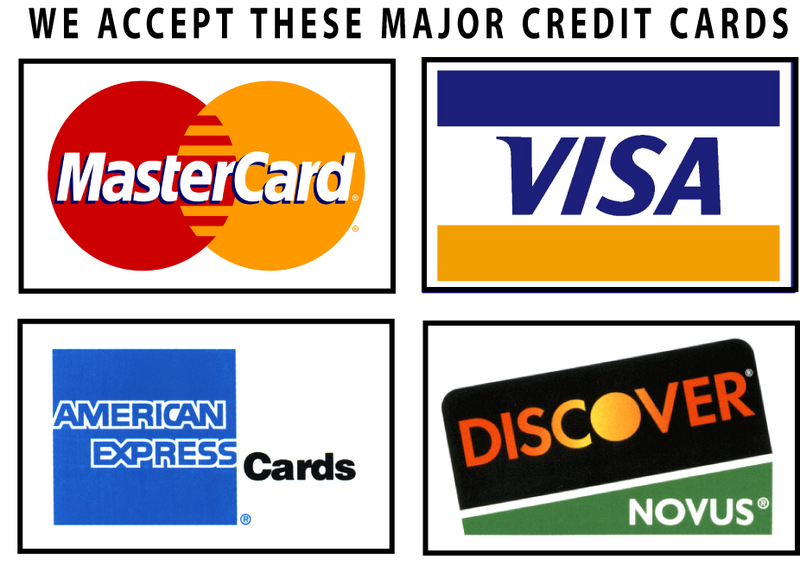 Choose a company that understands you & your event. 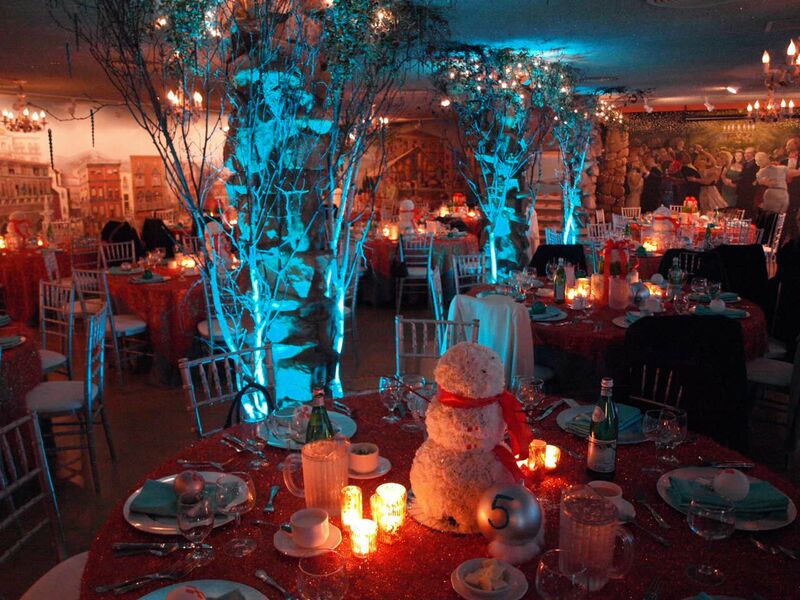 All the items at your event will look better with the right lighting. Your vision is the important to us! The right lighting can magically transform any space. Lighting costs can vary largly depending on the market, length of events, date of events, different distances traveling to and from venues, types of lighting fixtures required at different venues, varied seasonal & statewide demand, different themes, design & engineering, etc. Many things go into determining the exact amounts for pricing an event. But, Generally, lighting options purchased through most venues will be more pricey than going through a outside vendor. In this example we'll assume labor and supplies are included in the base package uplighting pricing. The general pricing above helps shed some light on what wedding lighting might cost. Labor costs and supply costs would be higher with more complex setups. If this lighting seems like it might be out of the budget range for your event, Give us a call we may have other options that might be a great alternative. 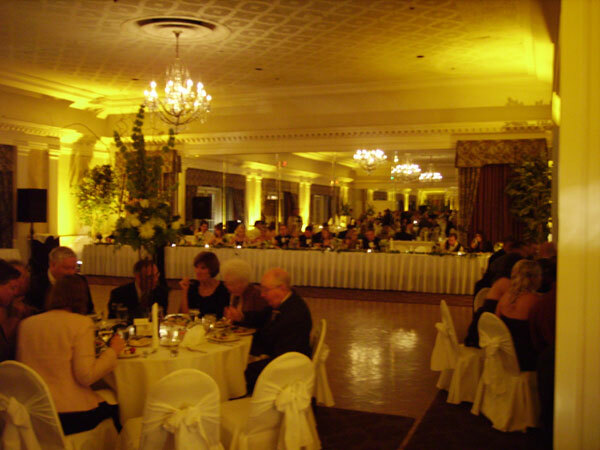 We have worked with many of the best venues in Connecticut, Mass. and Eastern NY area and we can offer our personal insight as to what the best lighting options will be best for each venue. 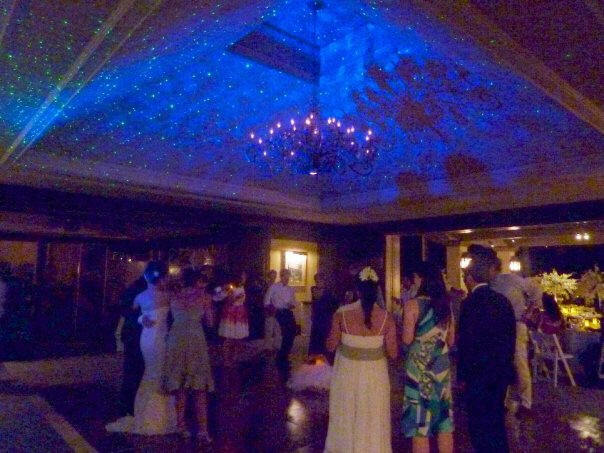 We can work within your budget to come up with a customized lighting package for your wedding that will set your wedding apart and make it truly unique & special. We can work within most budget to create the largest impact. With over 25 years of professional entertainment experience this just one of the things what makes us one of the best entertainment companies in New England.